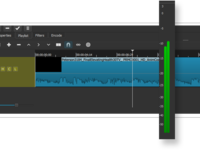 Open source multi-format video editing solution for Windows, Mac, and Linux. Supports webcam, screen, and audio capture. Pros: I'd like to start by saying Shotcut is a very good, multi-platform video editing solution. Even video editors with little to no experience will find the layout and usability of Shotcut to be appealing and usable. Import and organization of video files is straightforward and an array of basic editing tools will enable many users to complete high-quality video projects with little investment. Color grading and clip correction tools are surprisingly good for a free program. Another big plus is that it is lightweight, meaning it delivers a lot of power for a small program size and doesn't slow down real-time rendering trying to do too many other things. Cons: Again, Shotcut is a very good video editing solution - up to a point. Once your project gets more complex, the clip organization, preview speed and ability to integrate pre-set transitions and titles falls a little short. It'll get the job done, but other tools offer a more robust option. 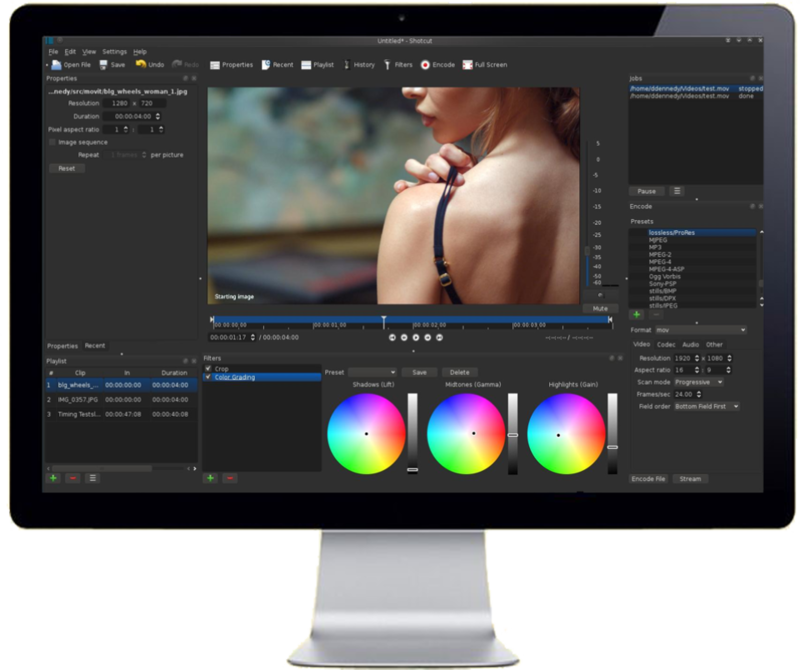 Overall: I was looking for a lightweight cross-platform video editing system for my laptop that could export easily to my more robust desktop editing platform and for basic edits and output for preview, and Shotcut will work well for this. I'm still undecided if it'll be a long term solution, but it is a surprisingly well thought out open source program that will fit many video editors' needs. Pros: Shotcut is free, and that is an excellent feature, but what I like best about it is that being open source, it has people working on it that actually care about the project and want it to be an excellent video editor.....which it is! I use it to edit my drone footage every week. Cons: Some of the earlier versions of Shotcut were buggy, but I have not had this issue in a very long while. Overall: I use Shotcut every week, and sometimes multiple times a week to edit my drone footage. I does as well as Adobe Premiere for zero cost. Pros: It's free! Shotcut being free doesn't mean that it is low quality though. There is a huge community that supports it, and continually work to make it better and add more features. The most useful feature to me is the the drag and drop, I can literally make a video in just a couple minutes if I need to upload something quickly but it has tons of powerful features that I can use if I need to make a higher quality video. Cons: Nothing really to complain about now. Some of the older versions had issues with dragging to the timeline, but this was fixed a few updates ago. Overall: Able to edit videos quickly. Able to create videos from images. Able to screen record gaming videos. Pros: As Windows Movie Maker has now discontinued, Shotcut provides a great alternative for video editing without a cost. The interface is intuitive and the functions are easy to get used to quickly. Cons: This does provide a basic video editing service and so if you are wanting to have more effects/functionality then you will be best going for Adobe Premiere Pro. But for a free solution, it works great. Pros: I love being able to access a quality video editing software with features that would normally only be accessible through the purchase of an expensive video editing package. 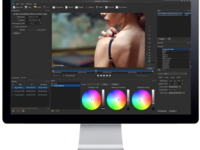 I can edit high quality 4k videos using this open source software for free! Cons: The software is a bit difficult to get used to and while there are loads of features it can take time to learn how to use them. Pros: It works and has a lot of capabilities. I'll explain more in my overall experience to show my joy with the software. Cons: The learning curve is different from other video editing software. That being said, you can't beat it. Overall: So let's tell a story. I was asked to make a small video and I hadn't done any real video editing outside of fooling around a few times with Adobe's counterpart. I have used Microsoft's and helped people use Sony's Vegas Pro (or whatever it is called). I figured the timeline would be similar to that and everything would just work that way. I downloaded ShotCut and ambled my way through making the video I needed. I was kind of saddened at my choices of free video editors and wasn't too happy with ShotCut at the time. I downloaded some more of the free choices (some of which have large names). After using ShotCut, I couldn't wrap my head around using those programs and how they work. I went back to ShotCut and got it done in minimal time because it made sense to me. Now I am very proud of ShotCut because it makes sense to me. Pros: Shotcut is a simple video editor. Reminiscent of the discontinued Windows Movie Maker, it has a clean, intuitive interface. 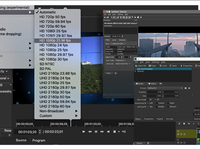 Unlike most free video editors, Shotcut has advanced features such as color correction and chroma key. It also lets users rearrange the workspace to their liking. Cons: While Shotcut works beautifully on Windows, I've had some problems using it on Linux systems. There are still bugs the developers are working to iron out. Also, while the rearranging of the interface can be a plus, it also makes it confusing for beginners. For example, the timeline doesn't appear until videos are added to it or a special button is pushed. Overall: I've been able to make stunning videos, ranging in length and complexity, on a short timeline! 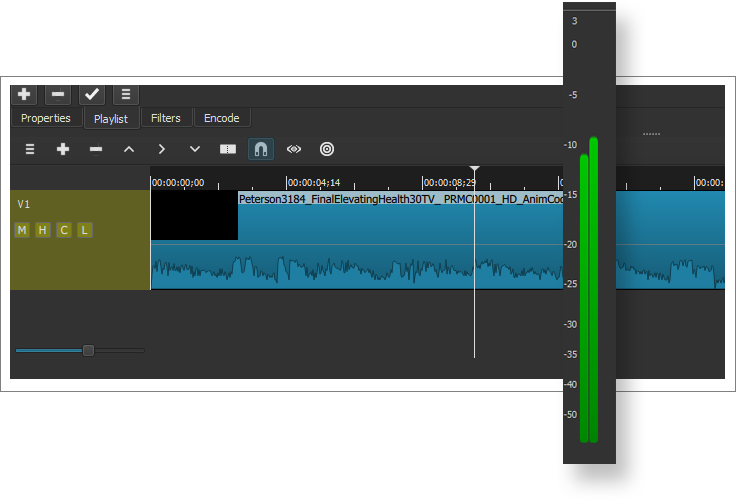 Pros: I like the feature set of Shotcut - the way it handles color grading is reasonably nice, the way it displays audio wave forms is helpful and visually appealing, and the more you use it, the more you discover features that are not immediately obvious when you first start. It can run on a Mac or a Windows, making it a good option to consider over iMovie or some other Windows options. There's also a pretty good sized online community of users, so tutorials are accessible. Cons: It seems to be a little bit "clunky" out of the gate. I run it on a 2015 MacBook pro, 2.7GHz, i7 with 16GB....maybe it's my machine but sometimes video playback gets slightly choppy. It isn't easy to navigate at first...lending itself to a pretty steep learning curve. Overall: Overall, I think Shotcut provides a good alternative to the easier-to-use iMovie...even though it's a little more difficult to use, in my opinion, it's also a bit more powerful. It cannot be compared to Adobe Premiere, however, that's a completely different animal of a much better nature! Pros: Shotcut offers a high quality platform to edit videos and create awesome works. The software is free, open source which saves you from having to purchase expensive packages. Cons: The user interface could use some work to make it easier for inexperienced users to interact with. This would make editing a faster process. Pros: This program allowed me to everything I needed for editing some tutorial videos for my staff. The program has lots of tutorials and they are geared for people who are not editing pros to do professional video editing. Super helpful. Cons: Some of the tasks are not intuitive or they are buried under menus. Quick google searches solved the issue. Pros: This software is great, you can make quality videos easily. The software is easy to use and allows you to compile videos clips, make edits to the clips, add music, and so much more. Cons: The software was incredible at putting clips together and making a smooth transition from one clip to another, it did however take some doing to get it just right. The final product was also real choppy when previewing it, so always had to export to see what it actually looked like, which wasnt choppy at all. Pros: The best thing about Shotcut is that it is free but still has the features needed to edit video projects. There are plenty of tutorials available for users to learn more when they want or need to. Cons: The program can be intimidating at first but with time becomes more user-intuitive. Pros: Fast and simple. Does what I need without too many confusing extras or "bloat." Cons: User interface and layout of windows can be confusing at times. Overall: I was looking for a simple, easy to use video editor that would run on my older Mac. Shotcut was the only product of the half dozen I tried that worked well. One of the best free softwares!! Pros: Has everything I need for amateur video editor! Has a lot of useful functions that aren't normally included in free software. Pros: It's REALLY powerful and FREE video editor. Can be a bit complicated but there's a lot of tutorials out there. Cons: It's not easy to use at the beginning. Watch some tutorial videos and you'll be proficient in no time.